NextGen PopUp Controller is an unique solution which offers Creation, Customization and Control of PopUps. We offer more than 62 in build templates which includes Merry Christmas and New Year templates . You can create new templates, save created templates, reuse existing PopUp Templates. You can configure (by adding rules) and show PopUps to visitors based on any combination of location (Country, State, City), User Role, Language, Page, Post, Category, Tags, Attribute, IP, date, time, browser, mobile user and more… With more than 45 combinations. With NextGen PopUp plugin you can Create and Control PopUps like never before and with zero coding necessary! Our PopUp plugin has Mailchimp, CloudFlare CDN integration, it is WPML compatible, works with WP Rocket, it has WordPress Multi site support, it is translation ready and with high performance. Works with WP Rocket cached single and multisites and compatible with WooCommerce, WPML, WP Super Cache, W3 Total Cache and CloudFlare CDN. NextGen PopUp plugin is powered by Mega Platform which is the most advanced and ersatile WordPress plugin that allows administrators to control elements in their WordPress site by the use of simple and complex rules. Create rules with unlimited Scenarios. Define complex rules using rule grouping. Allows dynamic control of PopUps based on properties such as Geolocation (Country, Region and State), User profile, date/time, etc. Supports simple rules based on singular properties, or complex rules based on mixed logical conditions which are based on multiple properties. 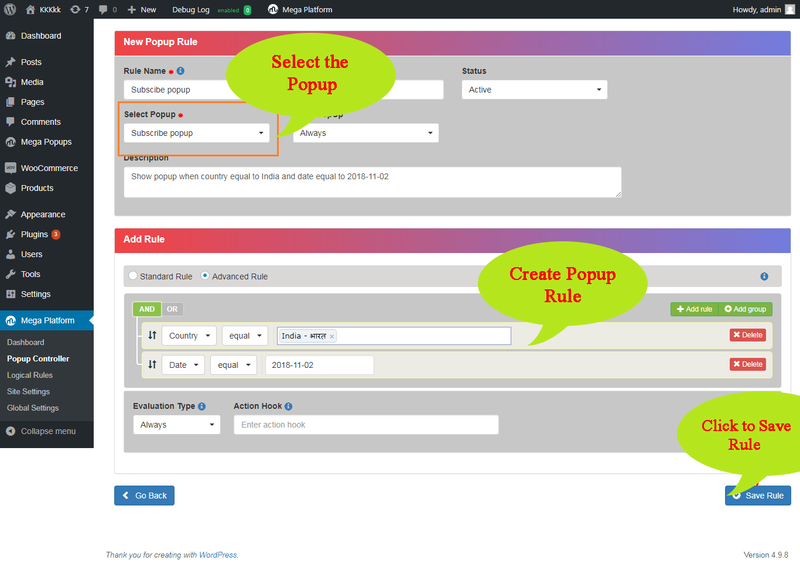 Using NextGen PopUp, we can define unlimited simple and complex rules for controlling PopUps. Here is the screenshot of showing PopUp if the visitor is from India. Below screenshot is an example of a complex rule, where Subscriber PopUp is shown if the visitor is from India having Subscriber role and accesing using iPhone after November 3, 2018. Now customers can use shortcodes in showing popups like contact form etc. Mail ajax bug fix, Custom taxonomies hide/show features added in this release. Merry Christmas and New Year PopUp Templates added.